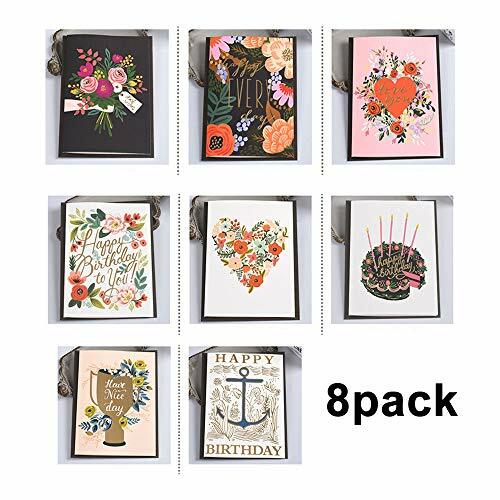 MINI Birthday Greeting Cards XWYL Value Pack-8 UNIQUE DESIGNS, GOLD EMBELLISHMENTS, WITH WATERCOLOR PATTERNS. *Composed of beautiful greeting cards and envelopes.Write your own best birthday wishes to the greeting card and give it as a gift. *Ideal birthday card with perfect delicate design and surprises in the envelope. * Exquisite bronzing design, perfect watercolor pattern, the texture of the greeting card is quite good. *Your 100% satisfaction is our ultimate goal. If you have any questions about this project, please feel free to contact us. *Click on Add to Cart today to get this wonderful accessory for your birthday party. * 100% Money Back Guarantee - We hope you are 100% satisfied with the purchase. There is absolutely no risk. Order our products now.